Took the car out for a drive today, planning on going to dinner. everything is working as it should. getting on the PA turnpike and I had to accelerate briskly to get into traffic, and a moment later I noticed that the RED alternator light had come on. Pulled of at a wide spot to check the belt and wires and shut it off. Not checking the belt with it running. Belt good, plug tight, tapped the VR a couple times for good measure and started it back up. Light still on and now my Autometer AFR gauge just had bars. I know that is because it doesn't turn on until the voltage is +13v So not charging. Replace the VR with another I had that previously tested good. still no charging. checked the plug on the relay plate again. looks good. I have not yet checked the wire connections at the alternator, possibly a wire vibrated loose during the brisk acceleration. So do I REMOVE the VR for this test? and jump between the D+ and DF at the relay plate. Leave the VR in place and short between those pins? Yes, disconnect only the VR. Jump the D+ and DF pins. See diagram below. Shorting D+ and DF will provide maximum voltage to the armature and thus maximum alternator output. Only do this test in short bursts as this stresses the alternator and battery to the max. OK did this test. Removed the VR and placed a jumper wire between D+ and DF on the relay plate. had a Multi tester hooked up and started the engine. tester showed voltage go to 15 , 16 and end around 17V when I shut if off. so the alternator is good. Maybe a bad connection? wires from alternator to plug look good. Ground cable between gearbox and chassi? Also B+ connection from alternator to starter checked and tight. Well if all works well great. I'd try driving it locally a bit. There is a possibility that you have brushes are going out. Put it under load (lights on) and drive it for about a half hour. It's rare when something is magically "fixed". Do also look for discoloration from heat on the harness, as this could indicate some damage making connection intermittently. And by the way you CAN pull the alternator with the engine in the car. It's not bad as long as the screws are not stuck. Put it under load (lights on) and drive it for about a half hour. It's rare when something is magically "fixed". I will be heading out to do that now. Will carry a multi-tester when I go. Need to get one of those Jump-start boxes just in case. The alternator was also new when I put it back together, so it has about 2K miles on it now. I understand that doesn't rule it out as a possible problem though. the tail and turn signals are LEDs (Thanks Spoke) and the headlights are Trucklite LEDs. I was trying to lessen the load on the alternator when I put it all back together. So this alternator problem continues to vex me. tested it by jumping DF and D+ and had good voltage, also tested jumping 12V to DF and also had good voltage. by these tests I ASSUMED the alternator was OK.
it was a rebuilt Bosch AL75X with 2k miles on it. Now during another 300 mile trip the Alt light came on at a about.250 miles. I was stuck in the mother of all traffic jams when I noticed the alt had quit. Not too worried about getting home since I had brought my new jump-box along. but it made it. Stopped for a few minutes at a truck stop about 15 mile from home and when leaving there the alternator started charging again. I had noticed the regulator was very hot and I replaced it with the new Beru unit. Took it out today for a little 40 mile ride and every thing was fine, decide to take the GF for a ride and before I get out of the driveway..... you guessed it, alt not charging. I was really working hard to bring this thing to Hershey, but other than bringing it on a trailer it has me beat.. I did hook up another relay board I had, and got the same result. I saw your tutorial on removing the alternator and will be following that. Along with one I found on the Bird board. To add to the complexity I do have HE and aux blower. Once I dis-assembled the ALT I found what might have been my issue. One of the brushes was not completely centered and 1/8" of it was not wearing down and it was extending in between the 2 copper rings. I believe the brush was touching something it was not supposed to. anyway here is a photo from my thread. I have a 75 and the HE do make it impossible to get the ALT out. I removed my AUX blower, hell that thing really did not do anything anyway. (IMG:style_emoticons/default/blink.gif) I am getting pretty good at removing and installing the ALT now, but what a pain, and all the pieces and parts and sheet metal etc.... What a pain. Best answer is to buy the best ALT you can and hope it never goes out again. I think malcolm2 is right -- and I don't think even Bosch rebuilds are immune. That's one of the reasons I ended up doing an alternator swap using a new manufactured alternator from a company with a good reputation. If you have a rebuilder in your area, maybe they can check yours out and be very careful with it if you go in with some 914world knowledge. Maybe they have some good Google or Yelp reviews.....? Might only take a day vs. getting a questionable re-built one from an assembly line rebuilder in a week. I say all that only to also say, my last dead ALT came from a mom and pop rebuilder. Turns out Jr was the rebuilder. He knows how to put them together and paint them, but probably is not quite there on the how-and-why skills, especially on these 45 YO alternators. I was the guinea pig. I am bored today. Hey Spoke, how is this??? I performed the tests below the red line. There are four connections to the alternator itself. D+, DF,D-, and B+. If you look at the Haynes book, what is not readily apparent, but is true nevertheless, is that the set of diodes that connect to the D+ terminal are a duplicate set (except for lower curent rating) to the ones for the B+ terminal, which is the actual high current output of the alternator. The D+ terminal is therefore a duplicate output terminal of the alternator, with less current capability. The lower set of diodes on current track 80 is common to both the D+ and B+ functions, and forms the ground return for both the B+ and D+ outputs. The DF or "Dynamo Field" terminal connects to the ungrounded end of the alternator field winding, and is an input to the alternator. The current supplied to the DF terminal determines the strength of the magnetic field that penetrates the output windings, and thus controls the alternator's output. The D- terminal is connected to the alternator frame, and is the ground return for the voltage regulator. The other end of the field winding is also connected to ground at this point. The Bosch alternator is incapable of self-excitation, or "boot-strapping" itself to an operating condition. Older DC generators and some U.S. alternators have residual magnetism retained in the core, or some other scheme to get enough field current to get themselves up and running. The Bosch alternator uses a different scheme. The charge warning lamp is connected between the ignition switch and the D+ terminal. When the car is first started, there is no output from the alternator at either the B+ or D+ terminals. The voltage regulator, sensing no output, is attempting to command maximum field current... it effectively shorts the D+ and DF terminals together. This places the D+ terminal close to ground potential, because the resistance of the field winding is not large. This means that there is +12 volts on one side of the charge warning lamp, and the other side of the lamp is grounded through the alternator field winding. Current thus flows through the lamp, lighting it. This same current, however, also flows through the alternator field winding, producing a magnetic field. This magnetic field is what the alternator needs to start up, and if everything is working correctly, that's exactly what happens. The alternator now begins to develop identical voltages at the D+ and B+ terminals. The D+ terminal is connected to one end of the charge warning lamp, while the other end of the lamp is connected to the battery via the ignition switch. Since the B+ terminal is hard-wired to the battery, and since both the D+ and B+ diodes are fed from the same set of windings in the alternator, no voltage difference can exist between these two points. The warning lamp goes out. The voltage regulator "watches" the voltage at the D+ point, which should be the same as that applied to the battery. It now changes the short between the D+ and DF terminals into a variable resistance. This effectively controls the field current (whose source is now the output from the D+ terminal, and not the charge warning lamp) and thus regulates the output voltage of the alternator. Fault conditions: When something happens to the charging system that causes it's output to be insufficient, the result is almost always a net voltage difference across the charge warning lamp, causing it to light. For example: Suppose an output (B+) diode opens. The efficiency of the main output is now considerably reduced. The voltage regulator does not know this, however, because it is looking at the D+ point. So, the B+ output is now lower than the D+ point and the warning lamp lights. Let's say that one of the D+ diodes failed: The D+ output is now reduced considerably. 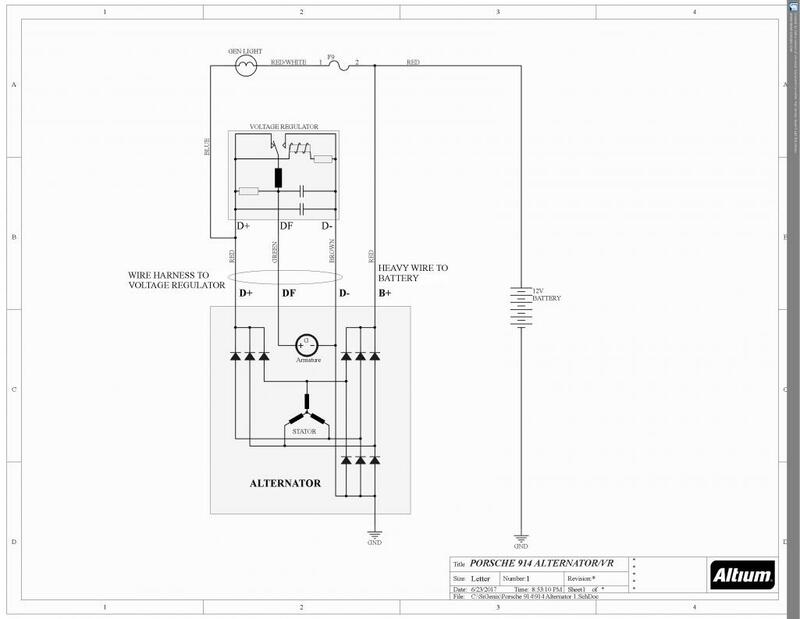 This means that the voltage regulator will have difficulty in maintaining sufficient field current for normal output. The field regulating resistance is low or short (between D+ and DF terminals) and the resulting load on the crippled D+ system drops it's voltage well below the battery voltage. Therefore, there is a net voltage difference across the charge warning lamp and it lights. The bottom line is that in order for your light to light, you must have a net imbalance in the outputs of the D+ and B+ sections of the alternator (or between the D+ output and the battery voltage, which amounts to the same thing). To trouble-shoot the problem, you need to check the various sections independently. Thus the first check: Connect +12 volts from the battery to the DF terminal on the relay board. This is the maximum field current situation, and should result in maximum output of the alternator. 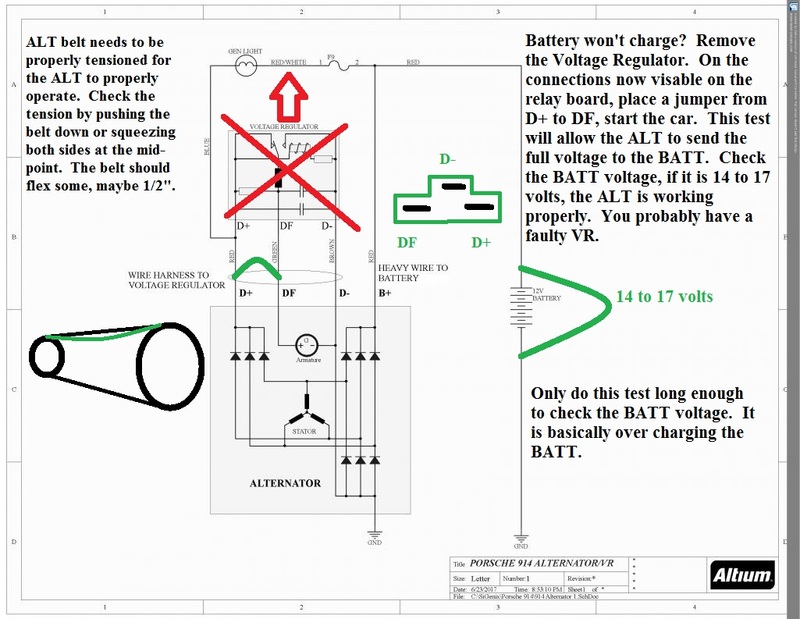 Note that this checks the B+ diodes, the alternator windings, and the common diodes. It does NOT check the D+ diodes. In the Bosch system, the size of the charge warning lamp bulb is critical. Too low a wattage bulb will not supply enough field current for "bootstrap" operation to be reliable. The Bosch book that I have states that the lamps must be at least 2 watts for 12 volt systems. If you have replaced your charge warning lamp recently, then too small a lamp may be your culprit. Yes, you must excite the Alternator to wake it up. A bulb, resistor or gauge may be used. I had my stock Bosch alternator professionally rebuilt for about $250 in Livermore CA. Dean's. Looks pretty too. This is why you can't place a LED in the dash warning light. It inhibits the current to create the field as it is a diode. I don't recall the years but there was a TSB for 911's with certain alternators, that specified installation of a resistor in parallel to the charge indication lamp to boost the current flow thru the alternator for excitation. We had an alternator/starter shop locally that we used, to avoided any of the rebuilt units available. They turned out a better product that any of out parts suppliers rebuilt units but it took a few days to get them done. They may still be around I don't know.